When we knot our shirts, we're cinching in the fabric by gathering it into one section, which makes the waistline appear smaller and defined, while hiding any areas we may feel insecure about. This basically creates a similar effect as if you were to wear a waist belt. The key is to create the knot on one side, not in the center. If you have the knot centered, it will make your midsection appear larger because all the gathered fabric will be pulled and gathered to the fullest part of the stomach. 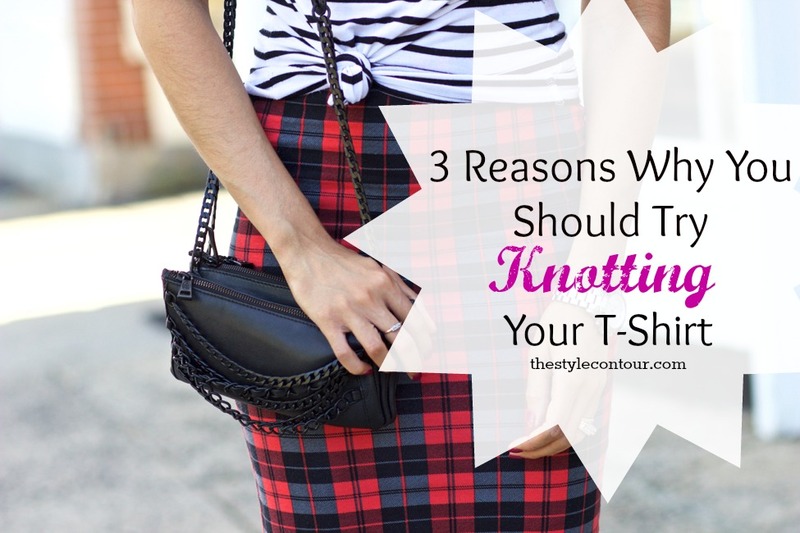 When you knot your shirt, you're bringing the shirt up a bit higher, essentially shortening the torso, which is great especially if you have a long torso and want to elongate your legs or show of your already long legs even more! Depending on both your preference and comfort, I'd suggest wearing a high waisted bottom to enhance the elongating effect and to provide more coverage, as with a low rise bottom, parts of your midriff may be visible. If you have a short torso, on the other hand, and don't want to shorten it any further, I then suggest you half tuck, as I did here, to create a similar vibe and effect. TIP: To get a perfect knot, pull the fabric together right next to the belly button (I prefer to the right side), tightly tie one knot, then double it, and gently pull the fabric on the sides of the knot. Take the two end parts of the shirt that stick out and tuck them inside of the shirt. What do you think, do YOU like tucking in your shirts? If not, are you more open to the idea or will you pass on this one? Thank so much for stopping by, my dear friends, and I hope you're having the most amazing start to your week so far!